Kangaroos are native to the continent of Australia, while tree kangaroos are also found in New Guinea. 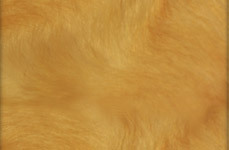 The word kangaroo is said to derive from the Guugu Yimidhirr (an Australian Aboriginal language) word gangurru, referring to the Grey Kangaroo (see photo to the right). The name was first recorded as kangaru by Joseph Banks on James Cook's first voyage of exploration, when they were beached at the mouth of the Endeavour River in the harbour of modern Cooktown for almost 7 weeks repairing their ship which had been damaged on the Great Barrier Reef. 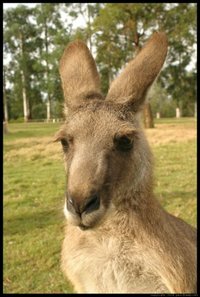 Kangaroo soon became adopted into standard English where it has come to mean any member of the family of kangaroos and wallabies. The belief that it means "I don't understand" or "I don't know" is a popular myth that is also applied to any number of other Aboriginal-sounding Australian words. Male kangaroos are called bucks, boomers or jacks; females are does, flyers, or jills and the young are joeys. The collective noun for kangaroos is a mob. The Red Kangaroo (Macropus rufus) is the largest surviving marsupial anywhere in the world. Red Kangaroos occupy the arid and semi-arid centre of the continent. A large male can be 2 metres (6 ft 6 in) tall and weigh 90 kg (200 lb). Tree kangaroos are arboreal relatives of the true kangaroo which are found in the dense rainforests of north-east Australia and New Guinea. Several tree kangaroos are endangered, largely because of habitat destruction. 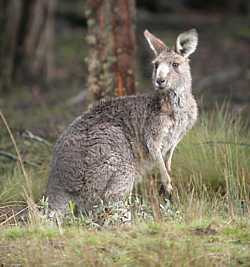 Wallabies are smaller, usually more thick-set, macropods. 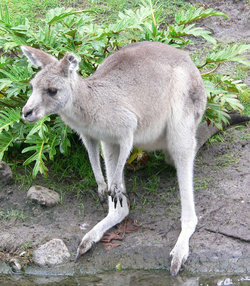 A wallaroo is a very large wallaby or a small kangaroo. Pademelons are small, forest living macropods of around 4 to 6 kg (9 to 13 lb). The Quokka is a small wallaby-like macropod of Western Australia. Rat kangaroo is a term loosely applied to any of several very small kangaroo-like marsupials, some from the family Macropodidae, some not. Kangaroo rats, in contrast, are rodents. Kangaroos have large powerful hind legs, large feet designed for leaping, a long muscular tail for balance, and a small head. 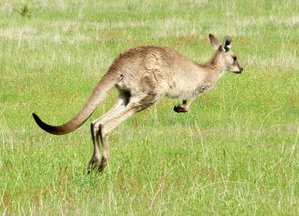 They are the only large animals to use hopping as a means of locomotion. Prices current as of last update, 04/20/19 9:21pm.